You really can't miss the Tillamook Air Museum. Driving into Tillamook on Highway 101, if you miss the huge hanger, with AIR MUSEUM, painted on the side then the jet perched on a pedestal along the highway is sure to catch your notice. You see, everything about the museum is bigger than life, and if you know the history of the hangar that houses it, you know how appropriate that is. Built in 1943, the wooden hangar was originally constructed for the U.S. Navy for the home base for blimps to be used in anti-submarine missions along the Pacific coast. After the war, the hangars have been used for everything from a lumber mill to a storage area for a blimp company. In 1992 one of the hangars was destroyed by a fire and since 1994 the remaining hangar has been the home to one of the most interesting museums in Oregon if you enjoy aircraft, architecture and history. "Between the aircraft, the building and the history it's very entertaining for people," said Larry Schiabel, manager of the museum. "We have people that come for the airplanes that end up staying for the history and architecture." Schiabel said about 80,000 people a year visit the museum, which doesn't receive public funds and is operated on what they make from admissions and from the restaurant and gift shop. On display in the main hangar are more than 30 aircraft, from World War 1 to an F-14 Tomcat from the modern jet age. The planes have been donated by private collectors, purchased by the museum and put on permanent loan by the U.S. Navy. The main portion of the hanger features several planes that look like they could be moved onto the tarmac and flow - but don't miss the canopy area where some of the finest privately owned vintage planes are stored. Lined up on display are several of the famous planes from World War II, such as a P-38 Lightning and Me-109 Messerschmitt. If you want to take pictures in the hangar, the lighting is very low - even during a sunny day - so make sure to bring your flash. In addition, ever during the spring the hangar can get a little chilly, so be sure to bring weather appropriate attire. "When people get here we like to direct them to the theater, so they can learn about the history of the hangar and the museum,"
Schiabel said. "We also let them know about getting into the cockpit simulator so they can know what it's like to be a pilot." Most of the planes in the museum are still able to fly, that's why they ask that you not touch the planes. But standing next to a huge F-14 Tomcat is quite the experience if you are an aviation enthusiast. "We have people fly in and pull their planes up on the tarmac," Schiabel said. "There is so much to see that people will come back multiple times. Our average visit time is about two hours, but you can spend a lot more time if you want to take in all the plans, history and stay for lunch." Also in the museum is a display that shows how the helium was stored for the blimps that were originally housed in Hangar B. Each step of the way plaques are on the wall with pictures and history about the facility and its purpose. In addition to the museum, make sure to check out their gift shop and café. The profits from both go to keeping the museum operating - and they offer aviation themed experiences. "The building is unbelievable," Schiabel said. "It's nice to be able to offer something like this to the public." About the Tillamook Air Museum: A non-profit museum that has more than 30 vintage aircraft on display in one of the major landmarks on the Oregon Coast - the blimp Hangar in Tillamook. The hangar spans more than 1,000 feet long and 192 feet tall and covers an area of more than seven acres. What to bring: Weather appropriate clothing, as the hangar gets chilly during the fall, winter and spring. Also make sure if you plan on taking pictures you bring a flash or have a flash built into your camera. Season: The museum is open year-round and hours are 9 a.m. to 5 p.m. daily. The museum is closed Thanksgiving, Christmas eve day, Christmas and New Year's day. Getting there: Located off of Highway 101 near Tillamook and is marked by a A-4 jet on a pedestal along the highway. Then follow the signs. 1. 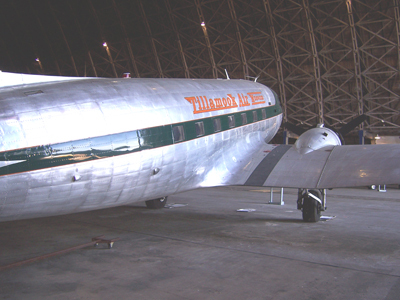 Visit the theater first to learn about how the museum came about and the history of Hangar B. 2. the exhibit hall has rare artifacts, models and photos from many different times in U.S. aviation history. Make sure to visit it. 3. You are free to roam around the hangar and take as much time as you like - but please do not touch the aircraft. 4. Information plaques at the front of the aircraft will give you a brief thumbnail about their history and importance. 5. Get into the aircraft trainer to feel what it was like to be a pilot.